I understand the subtitle of Neil Chapman’s1 new book Perfume: In Search of Your Signature Scent. Bookstore browsers will weigh the book’s satisfying heft and eye its vaguely 1970s-does-Deco cover and gold-edged pages. They’ll think, “I’ve always loved perfume, but I’ve never found The One. Anaïs Anaïs was great for senior prom, but maybe it’s time to find a perfume to express the real me.” They’ll leaf through the book’s beautifully designed pages with their two-color images, scan a few dreamy descriptions, and plunk down a credit card. Then they’ll be overwhelmed. Perfume is a book for the initiate, for someone who understands fragrance basics and wants to read about scent the way music lovers peruse opera scores. Most people like us gave up the signature scent idea a long time ago. Perfume begins with a few mini-essays on fragrance 101, then dives into the book’s meat: brief fragrance descriptions, some categorized by major note and some by mood. The book's major categories are green, citrus, flowers, the classics (floral aldehydes and chypres), spices, gourmand, eros (including powdery orientals, booze, tobacco, amber, musk, leather, and fougères), woody, meditative, oceanic, and anti-perfume and futuristic. I didn’t always agree with each of Chapman’s categorizations — Guerlain Vol de Nuit as a powdery oriental? — but I enjoyed reading the categories and finding my favorites. Each fragrance’s entry shows a stylized graphic of the bottle and lists the year of its release. The description that follows sometimes picks up a story from Chapman’s travels or life in Japan. Fragrances are described less by note, history, and data on perfumers than they are with a story or baroquely written description. 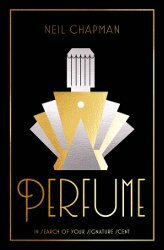 One red light to the perfume newbie is Perfume’s inclusion of discontinued — sometimes long discontinued — fragrances. The reader entranced by Chapman’s description of Schiaparelli Shocking as “full of cigarettes and nighttime persuasions” (I agree!) will be hangdog that it hasn’t been on the market for thirty-plus years. Chapman writes of Penhaligon’s Ostara that “if you want daffodils, this is the one.” Pity the daffodil lover who tries to track down discontinued Ostara at their local fragrance boutique. Internet sleuthing will turn up a bottle or two, but not for long. Chapman’s approach is less the critic than the inviting host who keeps refilling your glass. Chapman doles out his perfume descriptions with complex sentence structures, bouquets of modifiers, and extra whipped cream. For me, it’s comfort after a hard day’s work, but not everyone will agree. Any book of perfume reviews today begs to be compared to Luca Turin and Tanya Sanchez’s Perfumes: the Guide A – Z and last year’s Perfumes: The Guide. Instead of critiquing perfume as Turin and Sanchez do, Chapman aims to introduce readers to fragrances he admires. He writes from the perspective of ardent consumer rather than as an expert and insider. I doubt many readers will bow at Chapman’s feet, but they’d heartily enjoy coffee and a long chat with him about their fragrance favorites. So, you’ve been reading Now Smell This for a few years, and you’ve amassed a nice collection of fragrances. You know Jean-Paul Guerlain from Rodrigo Flores Roux, and no one has to explain to you the indignities Miss Dior has suffered over the years. Do you need a copy of Perfume? Probably not. But I bet you’d enjoy it as much as you do your Old Fashioned after work on Friday. It’s not a necessity, but it's a stimulating indulgence. 1. Neil Chapman blogs about perfume at The Black Narcissus. I’m familiar with Chapman’s writing because of his blog, so I assume I’d like the book. It came in the mail last week just as I got really busy at work. I’ve been too tired at night to read the essays. So far, I’ve enjoyed picking it up, along with a glass of wine, and leafing through different sections. It’s really a lovely book. You described it well. He is a wonderful host! Dipping into descriptions with a glass of wine in one hand sounds like a lovely end to a busy day at work! I read this book this week and really enjoyed it. What stood out for me was the care and thoughtfulness that went into each section. His approach is very aesthetic and I appreciated the way he unpacks and strips back his responses. The chapter on the forest scents, for example, really captured the quiet pleasure of being within light dappled woods and his descriptions of the accompanying perfumes aroused my curiosity. The tone of the book is nice and quiet rather than provocative so it appealed to me. I felt some notes were missing (probably based on my preferences in perfume) – for example neither frankincense or myrrh is listed in the index at the back of the book. This makes it difficult to locate perfumes with those notes (they are included in the incense section). Personally, I would have liked frankincense to have its own section as I feel it has (arguably) had more impact on perfumery than, say, coconut or coffee. But actually, it’s the personal nature of these books that give them heart…so I like that it isn’t a cover-all guide but rather a personal selection. I also thought that the art deco design vibe was a bit cliched. I associate Chapman with Japan so I wonder if he could have drawn on that visual aesthetic ….without the cultural appropriation. I was so glad there were not ‘star ratings’ to distract. I only know about 20% of the perfumes mentioned but that didn’t bother me. Next up a NST perfume book? Thank you for a such terrific mini-review of the book! The book says more than 700 fragrances are reviewed, which goes to show how many fragrances are out there–I missed a few of my favorites, too, but who can blame him? What a perfect description! I do enjoy a quiet book, so many seem to be provocative and a little over the top snarky. No snark here. Chapman chose fragrances he likes, so the descriptions are pretty positive. This book sounds lovely Something nice to pick up and read piecemeal. Thanks for reviewing! You’re welcome! I enjoy reading descriptions of perfumes. The only problem is that it makes it hard to choose the next one I plan to wear. I’m reading this right now – and I have to say I really like the way it looks – perhaps a bit retro but it just feels so luxe (and the price wasn’t luxe at all but totally affordable) with the gilt and the graphics. Thanks for the review. I’m reading it through more or less in order, an easy few before bed minutes each night. It feels substantial, doesn’t it? A few minutes before bed each night should lead to happy dreams! Ah! Neil’s book is out! So excited for him. I hardly ever post on his blog but I really love it. His writing style is so intimate. It’s almost like reading a very personal letter from someone (quite unique and fashionable) who is writing to a brother or sister or lover, and I have accidentally stumbled on the letter and read it. He really opens up. I have to get this book! What a wonderful homage to his site! I bet you’ll love the book. Okay. You totally, 114% read my mind. Exactly my sentiments about the book, better said. For $15 on Amazon and with the gold pages, it was well worth the journey–okay not journey–weekend ride–especially through Japan whenever it appeared. I’m glad you enjoyed the journey (and what do I have to do to get that extra 1%? ).